Lord Ganesha is the Lord of Obstacles, both of a material and spiritual order. 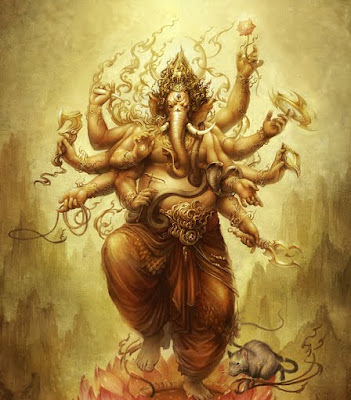 He is popularly worshipped as a remover of obstacles, though traditionally he also places obstacles in the path of those who need to be checked. His task in the divine scheme of things is to place and remove obstacles. It is his particular territory, the reason for his creation. Lord Ganesha is considered to be the Lord of letters and learning. In Sanskrit, the word buddhi is a feminine noun that is variously translated as intelligence, wisdom, or intellect. The concept of buddhi is closely associated with the personality of Lord Ganesha, especially in the Puranic period, when many stories stress his cleverness and love of intelligence. Lord Ganesha is identified with the Hindu mantra Aum, also spelt Om. The term oṃkarasvarupa (Aum is his form), when identified with Lord Ganesha, refers to the notion that he personifies the primal sound. According to Kundalini yoga, Lord Ganesha resides in the first chakra, called Muladhara. Mula means “original, main”; adhara means “base, the foundation”. The Muladhara chakra is the principle on which the manifestation or outward expansion of primordial Divine Force rests. Lord Ganesha has a permanent abode in every being at the Muladhara. Lord Ganesha holds, supports and guides all other chakras, thereby “governing the forces that propel the wheel of life”.